The virtual run on the A2B Journey finally descended to the bottom of Quail Basin of the Mojave National Preserve. (The next 20 miles will change to a slow, steady 2,000 ft. ascent. ) Today’s leg of the Journey passed by the Kelso Dunes Trailhead. 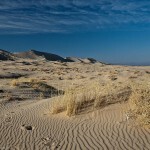 These sand dunes are open to hikers only. No off-road vehicles allowed. 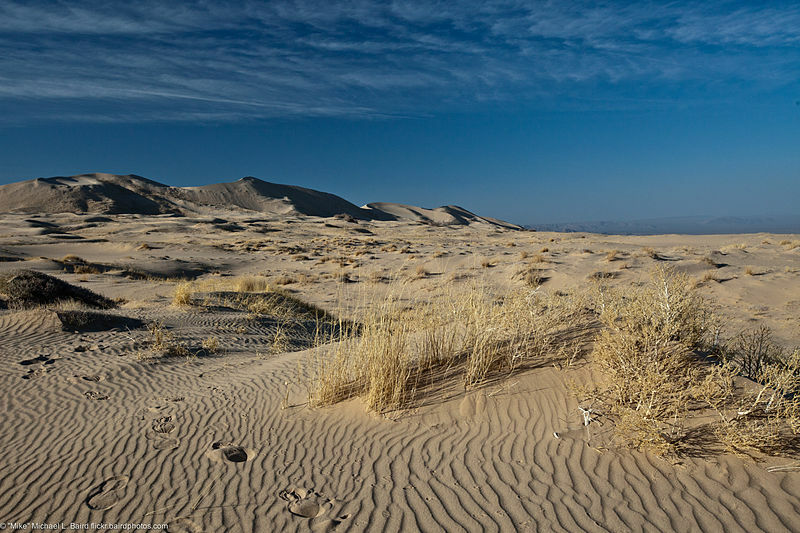 One interesting thing about this area is that the Kelso Dunes are known for a phenomenon known as singing sand, or “booming dunes”. Enthusiasts typically climb to the top of the dunes and slide down slowly, generating a low-frequency rumble that can be both felt and heard. The booming is much more pronounced when the dunes are extremely dry. Would be fun to try one day! One more item on the bucket list!! I did a long run with a group of about 30 runners from the Charlotte Running Club. Knowing that it would be long and hot, I wanted to make sure to stay hydrated throughout the run. So I reached in the freezer for two water bottles and a bottle of frozen Gatorade. (The ice melts as I run, allowing me to stay hydrated with cold water.) I wrapped each bottle in a small cloth towel for a little bit of insulation until needed. On the way to the meeting spot for the running club, I placed the Gatorade at the halfway point of today’s route. I took one of the water bottles out with me, leaving one for me to cool down with afterwards. Part of the run was on a beautiful greenway with lots of trees and shade. Even so, it was hot! This is when I am most thankful for my small 3-4 mile supply of ice water. Frozen Gatorade melts faster than regular ice. So by the time I got to it, I got enjoy a Gatorade slushie! Just Perfect!! The weekend goes by so fast. There is so much that needs to be done, with so little time and resources to get it all done!! Somewhere in the middle of the run I wondered about how much money and how many personal assistants I would need to knock out everything on my current list. More than once, I have been accused of “trying to fit 10 lbs. into a 5 lbs. bag.” Perhaps that is true. There are two personal attributes that serve as the key ingredients to that little quirk. First is that my mind is continuously tossing out ideas of every imaginable kind. Mostly useless, sometimes funny, occasionally practical, and every once in a while brilliant! (The hard part is to determine which is which.) Secondly, I do not like to sit still for too long. I don’t do idleness very well. (Who does?) And honestly, I hope that is one thing about me that never changes. I mean, it is okay to pause and enjoy the view when a new plateau is reached. But why stay there when the mountain peak is the goal? Plus the real adventure is in getting there. So with all that in mind, I spent the last part of the run considering the question, “In view of what I want most, what are the most important things to do today?” I now have 7 very meaningful items on my To Do List. I am excited to get started!